Jewish date: 29 Tammuz 5772 (Parashath Maṭṭoh-Mas‘e). Today’s holidays: The Three Weeks (Judaism), Thursday of the Fifteenth Week of Ordinary Time (Roman Catholicism), Feast Day of St. Dr. Doom/St. Thulsa Doom (Church of the SubGenius), Lucaria (ancient Roman religion), Feast Day of the Magi: Krishna (Thelema). If I can take a break from my series on Neopaganism—I still have a lot of work to do on my discussion of Gerald Gardner—I would like to talk about a protest I went to yesterday in Yerushalayim near the Prime Minister’s residence. As regular readers of this blog or my Facebook friends should know, there is a lot of fighting going on over the police being blatantly discriminatory against openly observant Jews and allowing the Waqf (an Islamic trust) to do pretty much anything they want on the Temple Mount, including rampant destruction of any and all Jewish artifacts they can find up there and, most recently, putting scaffolding directly on the Foundation Stone, the place where the Ark of the Covenant rested, while they do repairs on the Dome of the Rock. It should go without saying this is a gross violation of freedom of religion and Israeli law. Please see the relevant article “A-G: Israeli law is applicable on Temple Mount” and the article in which the Palestinian Authority gives its response, nothing less than the equivalent of a temper tantrum, “PA Slams A-G for Saying Israeli Law Applies on Temple Mount”. Also please see “Second Temple-era mikveh discovered under Al-Aqsa mosque”, which goes into the Waqf’s attempts to erase Jewish history from the Temple Mount. Further relevant articles dug up while writing this post: “Police Admit Permitting Arab Construction at Temple’s Foundation Stone for Six Years”, “Why the Temple Mount Should Matter - to Everyone”, “'Stop Wakf from destroying Foundation Stone'”, “Is Israel losing Temple Mount war?”, “Chabad Temple Course 'Scares' Muslim Groups”, “Anti-Semitism on the Temple Mount”, “'Israel has no right to interfere on Temple Mount'”, “A Found(dation) Stone Lost”, “Arab Rage: Putin Notes Jerusalem's Jewish Past”. 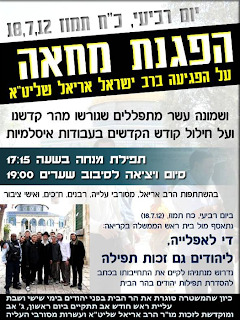 This flyer reproduces a letter from Binyamin Nethanyahu to Yehudhah ‘Eṣyon of the Ḥay weQayyam Movement in which he affirms his support for freedom of worship of all on the Temple Mount, regardless of religion. This is from 1995, 17 years ago. Some of us expect him to actually keep his word. This one announces a planned ascent to the Temple Mount this Sunday (July 22, 2012) for the merit of Rav ’Ari’el and those forbidden to visit the Temple Mount. Not listed is this is planned for 7:45 AM. I hope to be there, though I probably will not get there in time. The flyer on the left says, “Enough of coercion, enough of discrimination. Enough of trampling right of prayer.” The one on the right has already been discussed. This flyer complains that bringing a Qur’ān is considered OK, but a copy of Psalms is not. Anyone who can visit the Temple Mount on Sunday—or any other day—please do so. The police need the message that we will not bow to intimidation and will demand our rights. Do not be quick to accept “no” for an answer, and please hang around as long as possible if you do get “no” for an answer. You are not obligated to make the lives of those who enforce discrimination easy. Feel free to write up your experiences visiting or trying to visit the Temple Mount; I will be happy to publish them—and you may tell that to the police. Also, please sign this petition: “Petition Stop the Desecration of the Temple Mount”.